Currently, Jhpiego receives an average of 1.8 million USD per year from the United States President’s Malaria Initiative (PMI) to carry out malaria control efforts throughout Tanzania. Jhpiego staff on the Access to Clinical and Community Maternal, Neonatal and Women’s Health Services (ACCESS) program in Tanzania is hard at work training midwives, nurses and nursing-midwifery students on malaria in pregnancy prevention as part of the Mothers and Infants, Safe, Health and Alive (MAISHA) Program. Jhpiego’s malaria prevention efforts in Tanzania, however, began modestly nine years ago with only one staff member working remotely from Nairobi, Kenya. Dr. Muthoni Magu-Kariuki, Senior Program Manager in Jhpiego’s Tanzania office, recounts, “The large-scale malaria program we currently have in place in Tanzania actually began in [the year] 2000 in Nairobi, Kenya.” During the same year, the World Health Organization (WHO) unveiled its updated three-pronged approach to prevention of malaria in pregnancy (MIP), which stemmed from malaria research in Kenya and Malawi, and included: 1) the use of insecticide-treated bed nets (ITNs) by pregnant women; 2) the provision of intermittent preventive treatment in pregnancy (IPTp) using sulfadoxine-pyrimethamine; and 3) case management of pregnant women who have contracted malaria. The WHO also recommends that both ITNs and IPTp be promoted and received through comprehensive antenatal care services. Using the WHO’s approach as a platform, Dr. Magu-Kariuki assisted the Kenyan Ministry of Health in developing in-service training materials on MIP. These MIP training materials were initially integrated with the larger focused antenatal care (ANC) curriculum used by Jhpiego to train in-service providers in Kenya, and were later adapted for use in Tanzania where Jhpiego assisted with the first focused ANC/MIP training courses in the regions of Arusha and Iringa. 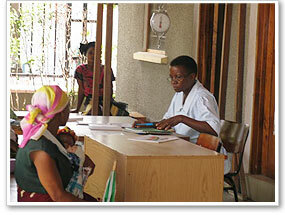 In September 2004 Jhpiego’s Maternal Neonatal Health Program ended and its follow-on program, ACCESS, began. The ACCESS Program worked with the National Malaria Control Programme and the Reproductive and Child Health Section to expand focused ANC/MIP training activities and to systematically train clinical trainers throughout Tanzania. By the end of the ACCESS Program’s first year, 24 facilities had trained staff in focused ANC/MIP. And by the end of December 2008, rapid scale-up of the program was achieved: 1,627 facilities had at least one health care provider trained in focused ANC/MIP, representing an estimated 33 percent of all Tanzanian facilities that offer antenatal care nationally. The ACCESS program also scaled up the training of FANC/MIP for pre-service nursing-midwifery instructors. ACCESS has revised the ANC component of the nursing-midwifery curriculum to include MIP and has trained tutors and clinical preceptors from all certificate, diploma and higher-level nursing/midwifery schools in the country. The curriculum has been updated in a total of 53 schools, and there has been more than 3,200 graduates trained in FANC/MIP to date. In addition to in-service training, ACCESS has scaled up focused ANC/MIP training activities for pre-service nursing-midwifery instructors. Specifically, the Program has revised the antenatal care component of the Tanzanian nursing-midwifery curriculum to include MIP, and has trained tutors and clinical preceptors from all of the certificate, diploma and higher-level nursing-midwifery schools in the country. To date, the curriculum has been updated in 53 schools and 3,200 graduates have been trained in focused ANC/MIP.